Intel's forthcoming Medfield smartphone chip is more of a jab than a knockout blow, say analysts. SANTA CLARA, Calif. (TheStreet) -- Intel's (INTC - Get Report) Medfield smartphone chip debuts later this year, but analysts say that the processor is more of a jab than a knockout blow aimed in the direction of the market leader ARM Holdings (ARMH. "Medfield is a small step closer," Tom Starnes, an analyst at semiconductor research firm Objective Analysis, told TheStreet. " But it's not like the grappling hook is over the wall and you know that you're in." 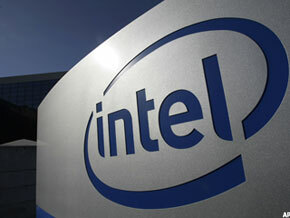 Despite cornering and ruling the PC chip market, Intel's way late to the mobile device game. Its biggest challenge: chipping away at the vast ARM ecosystem. The British chip designer has said its technology is found in some 95% of mobile phones and smartphones. With ARM cornering the market in low-power chips, Intel must overcome its reputation for high-performance, but also higher power, silicon, say analysts. "The reason why ARM has done so well is because they are much more thrifty in terms of battery performance," said Starnes. "You can get away without screaming performance, but the battery needs to last all day." Intel CTO Justin Rattner acknowledged that his firm has a big job on its hands during an interview with TheStreet during the company's annual research day earlier Tuesday. "We recognize that the market for our technology extends well beyond the PC, and we're undergoing a significant transformation internally to serve those markets," he said. "This is not just phones and tablets, but in areas like television." Rattner pointed specifically to Smart TV, where Intel is working with Google ( GOOG, Sony ( SNE and Logitech ( LOGI to build devices that integrate a broad range of Internet content. "At CES, virtually every device on the show floor that claimed it was a Smart TV was powered by Intel," he said. Starnes, though, was unmoved by this news. "To me, it's like fine, great, but who is buying that stuff?" Intel, though, may have some tricks up its smartphone sleeve, specifically its 22-nanometer chips, which come with a new form of "3-D" energy-efficient transistors. Touted as using 50% less power than the company's 32-nanometer offerings, the transistors will debut on a server chip next year. Dadi Perlmutter, Intel's executive vice president, recently confirmed that the company does have a date for putting 22-nanometer chips with 3-D transistors inside smartphones and tablets, but refused to divulge further details. Speaking during the company's recent first-quarter conference call, CEO Paul Otellini said that he would be surprised if "12 months from now, you don't see Intel-based smartphones" on the market. He also said that Intel is "actively working with a large number of handset makers and carriers on Medfield-based designs" and is "committed to success in the smartphone segment." Intel, he said, is working on chip designs for platforms including Nokia's ( NOK Meego, Google's ( GOOG Android and Microsoft's ( MSFT Windows. "It's very important for them," Doug Freedman, an analyst at Gleacher & Company, told TheStreet. "It's not so important from a five to ten year financial perspective, but by gaining share they will at least show that they can participate in the complete computing continuum." Freedman explained that much of the growth in computing is happening in the handset arena, leaving Intel little choice but to ramp up its efforts in the smartphone space. "They need to be where the computing is taking place," he said. "If PC units don't grow, or grow slower because of growth in handsets, that's an issue," he added. "I don't think there's anything fundamental about smartphones that we don't understand," said CTO Rattner. "We continue to invest heavily in that space." The consumer tech giant, of course, has been down the mobile processor road before, but sold off its XScale mobile processor technology to Marvell ( MRVL in 2006. Has XScale left a bad taste for Intel? Quite possibly, says Starnes. "They did a superb job with XScale but the market didn't buy into it," he said. "I think that they are still struggling with that." Intriguingly, new rumors of an Apple ( AAPL/Intel partnership have been rekindled this week, highlighting Apple's use of Intel chips within devices such as the iPad and iPhone (Apple currently uses ARM-based chips). Clearly, that would give Intel a huge elbow into the market. Neither company has yet responded to TheStreet's request for comment.